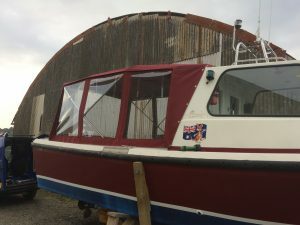 Ophelia and Brian were no match for repairers Steve and Julie – who got these unlucky sailors back on the water in no time. 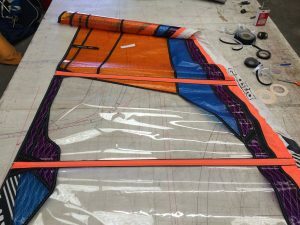 (Slimline luff panel patch for the Severne, and a superb reconstruction for the wave-mangled Best Cabo). 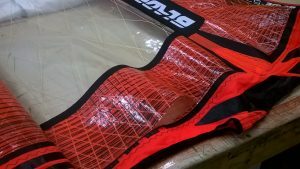 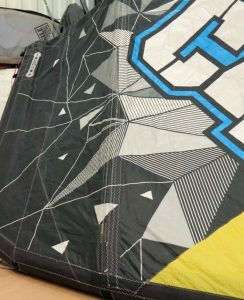 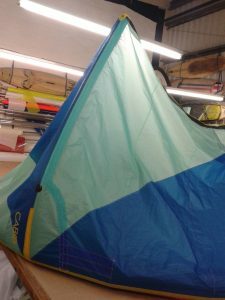 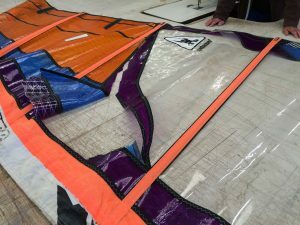 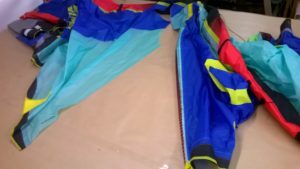 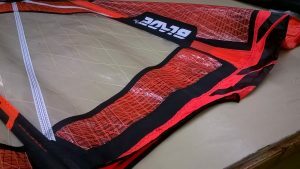 Contact RB Sails for quality sail and kite repairs on 01736 754659. 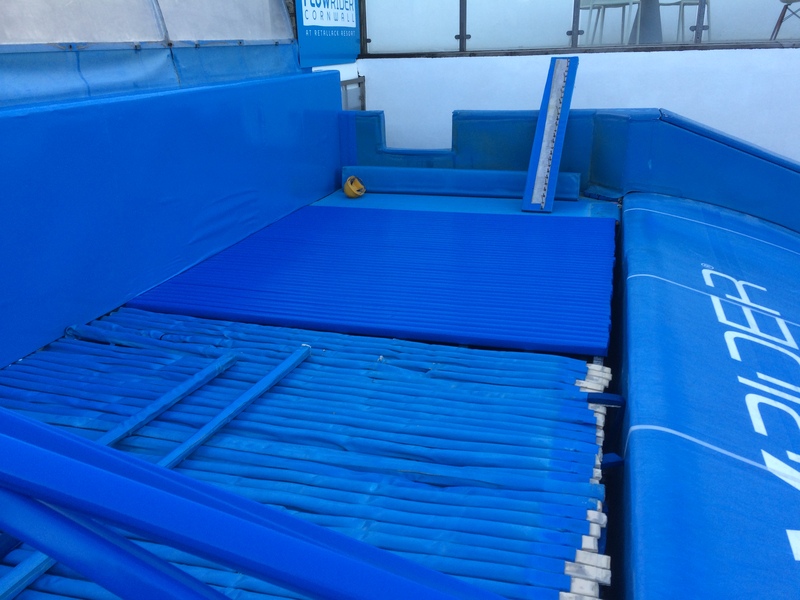 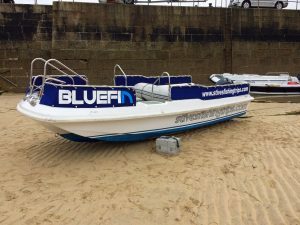 Bluefin Charters in St Ives needed a bit of extra shelter for it’s customers when they are transported from shore to the main boat. 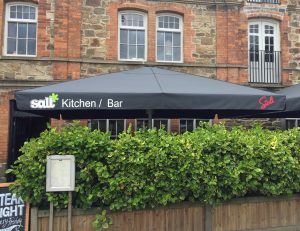 RB SAILS manufactured these made to measure dodgers / fabric in fill panels and we printed the logo and website address to increase the advertising potential. 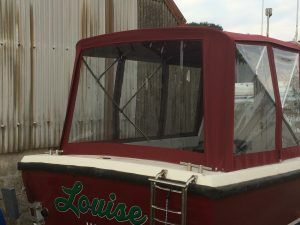 These custom printed dodgers really help to make the boat stand out in the harbour. 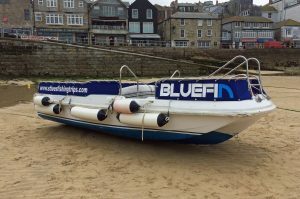 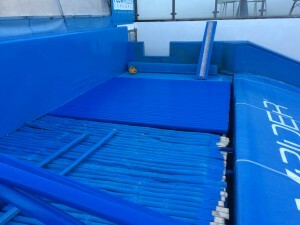 If you want to charter a fishing boat then visit www.stivesboattrips.com. 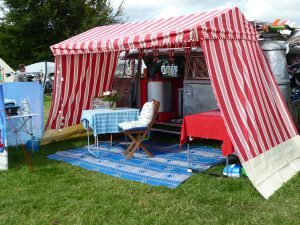 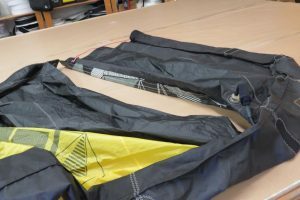 If you have any boat covers, dodgers, boat upholstery or sprayhoods for private or commercial boats then get in contact with RB SAILS on 01736 754659. 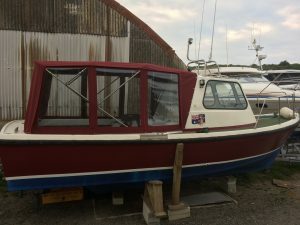 The Kathleen & May is Britain’s last working three mast, wooden hull topsail schooner and the only one of her class still in operation. 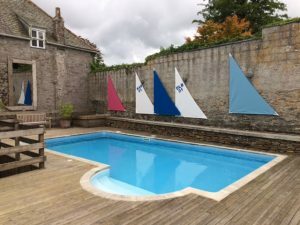 As part of a festival the schooner was sponsored by HSBC and RB SAILS were commissioned to manufacture some promotional sails. 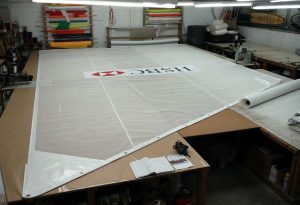 As the sails were for static display but actually rigged on the boat as normal sails the fabric chosen was PVC mesh. 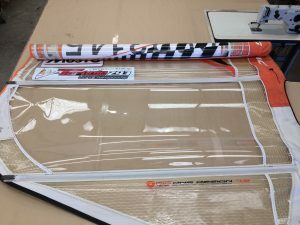 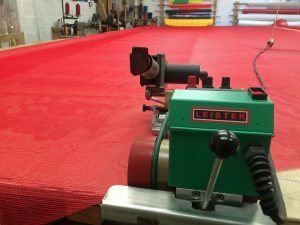 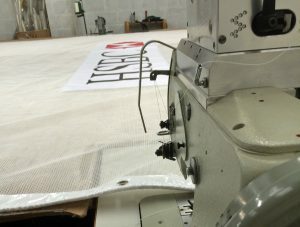 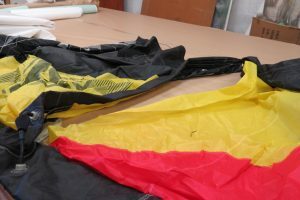 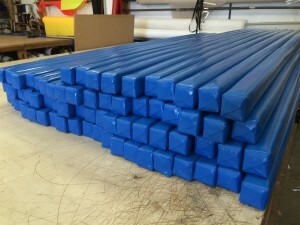 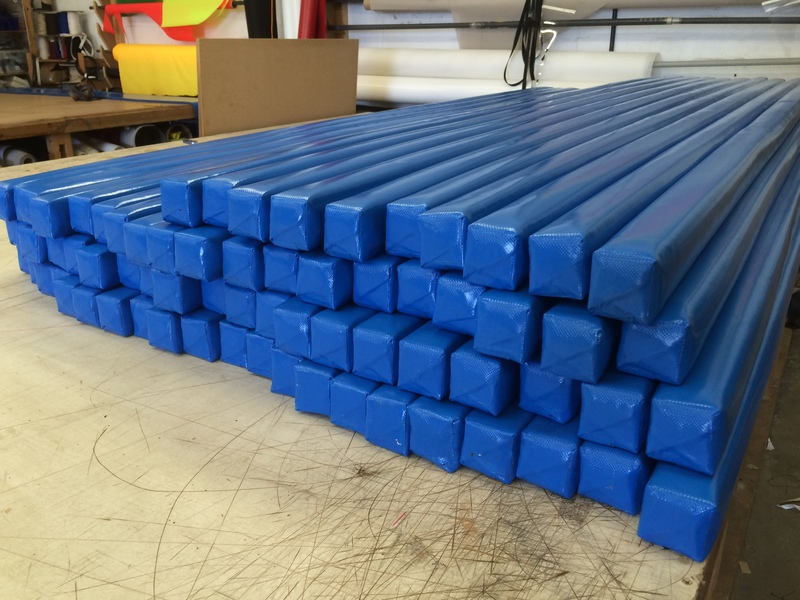 RB SAILS can weld the seams on PVC using our Liester hot air machine. 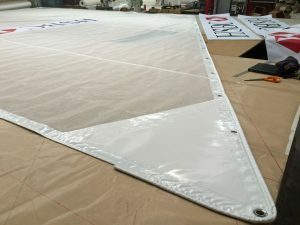 We finished the sail off with heavy duty reinforced corners and a bolt rope with eyelets which is similar to how the sail would normally be made. 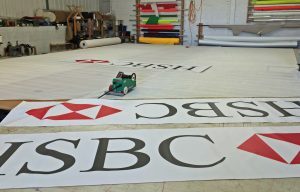 The HSBC banners were printed and added to the sails by ourselves and then delivered to the Mersey. 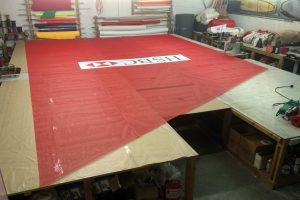 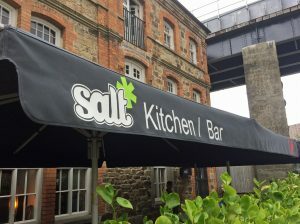 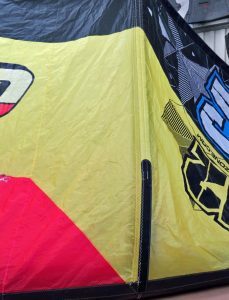 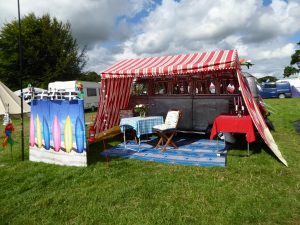 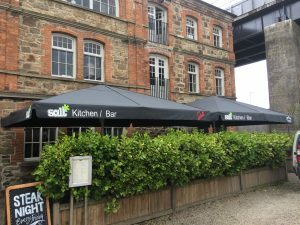 If you require and specialist one off sails with custom printing for promotional purposes then contact us on 01736 754659.